Dear readers, tonight with me is woman born to a Scythian mother and a vampire father. She is here to tell us about the threats to her world – and how she enlisted the last remaining vampires to fight the demons. I grew up in a rural village on the Romanian Plain in the foothills of the Carpathian Mountains. I have not been back there since I was a child, but what I remember most is the mountains themselves, their white capped peaks in the winter and the way clouds would hang low in the springtime, cloaking them like a secret. Your parents were murdered when you were still a young girl. What do you know about them? My mother Aarani was the leader of our village. She was a Scythian, or what some history books now call The Amazons. She was strong and fierce and had the ability to connect with the life force of all living things, from the smallest mouse to the largest bear. She led many successful horseback raids on passing caravans of rich merchants travelling across the plain – until the night she met my father Vasile. That night she realised quickly that he was unlike anyone she had met before, unlike any human. That’s because he was a strigoi, a human transformed by the bite of a vampire. They fought for hours and when they eventually laid down their weapons, they both knew they had met their match, their equal. About a year later I was born and that’s how I came to be the original descendant – the first child ever born to strigoi and Scythian parents. I live in a rural farmhouse with my four sisters, just north of Vermont by the Canadian border. Our day-to-day lives are much the same as they’ve always been, tending to our crops and taking care of the horses, although after everything that’s happened things are a little different now of course. Well, to begin with I don’t think any of us will ever be the same. I spent my entire life searching for the creatures that killed my parents and the council, the world’s last four remaining vampires, had refused to help me – until Gabriel came into the picture of course. Oh, Gabriel… I don’t even know where to start with him. At fist I wanted to kill him, but when I realised that he, a strigoi with no idea who or even what he was, was actually the key to everything I had been searching for, I couldn’t believe it. What did you first think when you realised just how important Gabriel actually was to all this? What did I think? Honestly, I thought there must have been some mistake. I mean, this strigoi with no understanding of anything was thrust into my life and immediately upset the balance of everything. He didn’t even know what a strigoi was… And he was one! The thing is, he was so confused, so damaged and full of guilt for everything that happened before I met him. I didn’t know how I would ever make him understand just how important he really was, not just to the quest we were on, but to the entire world. The demon Melloch. My entire life I had been re-imagining him as I saw him that night, standing over my mother’s body, his black lifeless eyes staring down at her. I’d never seen a creature like him. I was just a child then, I didn’t know demons existed until the night he came and took everything from me. When we eventually realised he would lead the Reaper Army to the surface, I knew without a doubt that I would have to face him again. What was the worst thing about the war? Well, apart from the war itself and everything that happened, I think the worst part is that it was all preventable. Humans just don’t seem to understand. Yes, resources are important, but nothing matters more than preserving our earth. Since the industrial revolution, carbon dioxide has climbed to its highest levels in 800,000 years due to human activities including the burning of fossil fuels, such as coal and oil, the making of cement and deforestation. It was our job to at least try and give them a second chance, a chance to learn how to love all life – not just each other. What was the best thing about it, if there is a best thing? For us, the war irreversibly changed things. We can’t go back to how things were before, and our family unit is very different than it was, but we certainly cherish what we have now. Personally, my life is very different post-war and the things that have happened… I don’t even know where to start. But, if there is a best thing then I think it’s that we were all forced to put our fears aside, to find the warrior that lives in each of us, and to stand up for what’s right. In the end that’s always what matters most – and that’s what we did. Together. My friends. Well, I can’t say I’d ever really had any friends other than my sisters. Keeping our existence a secret made it pretty hard to have friends, and to be honest, I never really had time for any of that anyway. That all changed of course when I met Gabriel and he inadvertently brought Harrison Hargreaves into our lives. I had never trusted a human around my family and I certainly didn’t trust him. It’s funny you know, I always thought there was a certain strength that came with keeping your distance, especially from humans, but after everything that’s happened, I guess I was wrong. Demons, Melloch in particular. I hate him for what he’s taken from me, but the truth is I do understand that evil, in some form, has to exist. As I said before, our world is built on balance. For every darkened corner, there must be a pool of light. For every tear, there must be a smile, and for every rush of love, there must be the twist of hate. What matters is that we don’t let our demons define us, Melloch or the ones that live deep inside our own shadowy depths. That’s funny actually… You’ve just reminded me of the time I first asked Gabriel if he had coffee in his cabin. You should have seen his face. It was like I had asked for demon bran. In fact, I think he actually said something along those lines… But seriously, I love coffee. It’s one weakness I don’t mind sharing with the humans. I don’t really have a favourite colour, and to relax I love just lying on the grass with my wolf Aurel, stroking his fur and feeling the earth between my toes. Well I can’t tell you everything of course, in fact I shouldn’t even be doing this interview given what’s going on at the moment, but I think it’s important that humans start to understand who and what we are. And that was a major part of all this. If we are going to help them understand how to save their world, then it’s time they started to accept our existence. It’s a big step for us, but I think if we are going to help them, we need to locate the other descendants and work together to change the course of our world. Really? A secret? Okay, well at the moment my sister Jasmyne is travelling across Europe to learn more about a book called The Codex Gigas. It’s also known as the Devil’s Bible and from what we understand, a human is going to try and steal the book from its home in National Library of Sweden. He’s going to try and unlock the devil’s curse to try and… Oh, I shouldn’t be telling you any of this. That’s enough, the interview is over. Nikki Lee Taylor is the author of The Descendants, a five-book paranormal romance series. She wrote her first book in crayon at the age of four and later became a news journalist. 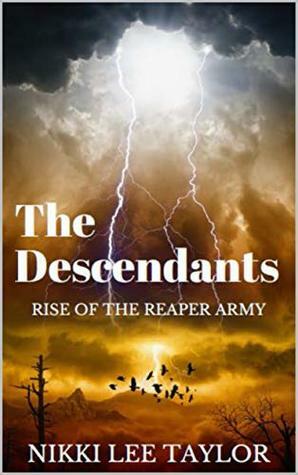 Rise of the Reaper Army is her debut novel. She lives in NSW, Australia. Join us next week to meet a young woman skilled in the magic of blood glyphs, desperately trying to save her dying mother . Please follow the site by email (bottom-right) to be notified when the next interview is posted. Dear readers, remember all the times your mother told you not to stray into the woods? Well, tonight with me is a young girl who didn’t quite listen, and went strolling into the Wyrde Woods. Only a few miles away from the dilapidated council estate where she lives, but worlds apart. She is here to tell us about what she saw, and how her perceptions were challenged. I’ve been mangled in the care system for most of my life. Care homes, institutions, clinics and, erm, sometimes juvenile detention. It wasn’t….it wasn’t safe, that’s all I have to say about it. Some places were worse than others, but none offered any sense of security. My cup of tea was reading. I’ve always been a voracious reader. So I suppose my favourite ‘toy’ was Susan Cooper’s The Dark is Rising series, especially Greenwitch. I literally devoured those books. Reading was an escape from whatever dump I’d been placed in. As for memories…..sometimes I have very vague memories of my mum and dad, a few images, but they’re like blurry photographs, the focus always just out of reach. Then again, I might just be projecting, my imagination playing tricks on me.